Director – Jon Amiel, Screenplay – Cooper Layne & John Rogers, Producers – Sean Bailey, David Foster & Cooper Layne, Photography – John Lindley, Music – Christopher Young, Visual Effects Supervisor – Gregory L. McMurray, Aurora Borealis Sequences – Hammerhead Productions, Interior Earth Effects – CIS Hollywood (Supervisor – Bryan Hirota), San Francisco Sequences – The Computer Cafe, Shuttle Crash Sequence – Rising Sun Pictures, Trafalgar Square Sequence – 3D Site, Underground Sequences – CREO (Supervisors – Rusty Ipolito & Andy Lesnick), Miniatures – Cinema Production Services, Fantasy II, Grant McCune Design & Sessums Visual Engineering, Special Effects Supervisor – Garry Elmendorf, Production Design – Philip Harrison. Production Company – Paramount/Core Productions/MFP Munich Film Partners New Century. Strange phenomena are appearing all over the world – in Boston, people’s pacemakers suddenly stop; in Trafalgar Square, birds navigation systems go haywire; while communications blackouts cause the space shuttle to have to make an emergency crashlanding in the L.A. storm culverts. Geologist Dr Joshua Keyes is brought in by the government to consult and realises that the Earth’s magnetic core has suddenly stopped spinning. This will spell the end of all life on the Earth within one year. He proposes an ambitious scheme – to travel to the Earth’s core in a special vessel designed by Dr Edward Brazzleton that is capable of drilling through rock and detonate a nuclear weapon that would start the core spinning again. As the prototypic vessel Virgil is launched and begins its maiden voyage, Keyes and his crew not only have to deal with disasters along the route but with a general in mission control who is threatening to detonate a device that may make the situation even worse. 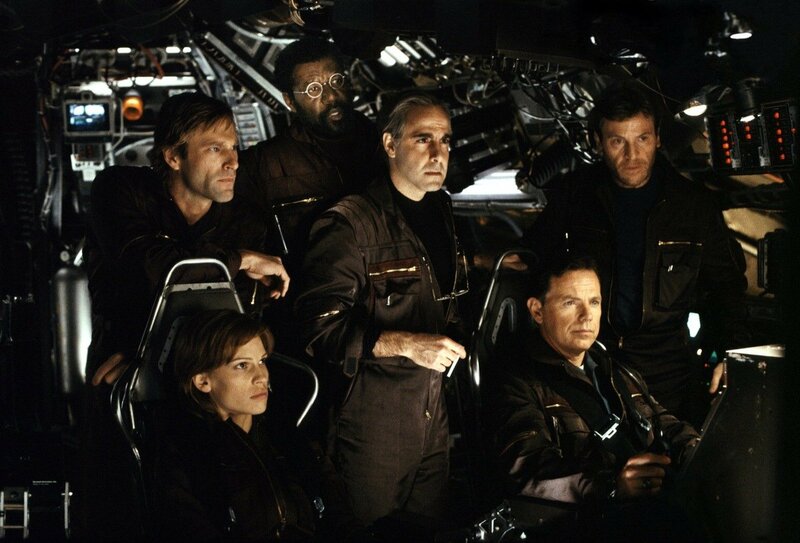 The Core was 2003’s Armageddon (1998). It is a film that comes with the same over-inflated concoction of elements that had Armageddon laughed off screens – it is big and brainless, it is dizzy with its own scale and budgetary excess, it is filled with stock characters and cliches, and it features a roughly equivalent plot of people on a mission into uncharted territory to save the Earth from certain destruction. It certainly has all the elements that make you think Armageddon director Michael Bay would have been green with envy that he did not get the chance to direct it. Not unexpectedly, most audiences laughed The Core off screens. At some conceptual level The Core feels like someone had decided to meld Fantastic Voyage (1966) with a remake of Journey to the Center of the Earth (1959), or perhaps even more so At the Earth’s Core (1976), albeit conducted with a more contemporary geologically accurate picture of the centre of the Earth. First and foremost though, The Core is a big CGI disaster film a la the likes of Independence Day (1996), Twister (1996) and Dante’s Peak (1997), one that has been construed as no more than a series of spectacularly self-contained disaster set-pieces, often irrespective of any of them making sense. The first half of the film offers these at almost regularly timed intervals – the opening scene with people in Boston collapsing as their pacemakers short out (although you wonder why pacemakers are unaffected when other electrical systems are not); The Coliseum being blasted apart by lightning (despite the fact that The Coliseum is made of stone, which does not conduct electricity); The Golden Gate Bridge being fried and blown apart by microwave radiation from a hole in the ozone layer (something that is extremely unlikely to have much more effect than giving people a sunburn, let alone boiling stretches of water and melting metal struts); the space shuttle being forced to make an emergency crash landing in the L.A. drain system (which, considering the speed the shuttle travels and the lack of parachute brakes being employed, would in actuality leave an impact crater a mile or more across); and birds doing an Alfred Hitchcock and suicide bombing humanity in Trafalgar Square. In all cases, the phenomena in question are never mentioned again outside of the particular sequence. On the other hand, for all that one calls it big and brainless, you have to credit The Core for researching or at least appearing knowledgeable about its geology. One does not have enough of a geological background to nitpick the science here so at least it does a creditable job of pulling the wool over people’s eyes. In fact, unlike Armageddon or Irwin Allen, who insulted their audiences in their flagrant disregard of basic plausibility or research on these matters, The Core almost goes the other way. It gives the impression of being written by two teen geeks wired on too much caffeine who had fun coming up with outrageous perils to place the protagonists into and even more outrageous and ridiculous ways of contorting scientific notions to get them out of it. The film frequently feels like the scientific doubletalk of Star Trek: The Next Generation (1987-94) doing acid. While the basic idea of a ship drilling to the core is plausible with a stretch, and basic lip service is paid to pressure problems and the need for masses of coolant, the film seems to ignore many of the other attendant problems. The reason the Earth’s core spins and produces magnetism is due to the fact that the Earth rotates – it would be impossible to stop the core rotating without stopping either the Earth’s rotation or entirely negating the effects of gravity. I also fail to believe that a metal capsule would be able to survive several hundred miles down – the reason the Earth’s outer core is molten is because the pressure at that depth does not allow metals to survive as solids. That the climax of the film involves the survivors managing to rewire the interior of the capsule in a matter of minutes to convert the ship into a solar sailer to take advantage of an oncoming wave of nuclear explosions and then once free rewire the powerless ship to turn the sonar signals of a pod of whales into a communications device probably says all there is to about The Core‘s basic level of plausibility. The characters in the film are written entirely to cliche – the ordinary guy hero; the token woman who has to prove herself capable of making tough command decisions; the suggestion of romance between her and the hero; the untrustworthy general covering up secrets; the teen geek who proves single-handedly capable of saving the mission (not to mention casually creating a program that will hack and re-edit the content of every website in the world), the pompous self-important windbag who must face the results of his own decisions. None of these characterisations are conducted with anything other than cliche depths. Indeed, it becomes rather laughable when the script has every single member of the Virgil crew but one offering to or actually sacrificing their lives so that the mission might go on. The Core is directed by British-born Jon Amiel. There used to be a time when Jon Amiel seemed like a director of great promise. Amiel did after all make the stunning tv version of Dennis Potter’s The Singing Detective (1986) and then went onto the likes of Aunt Julia and the Scriptwriter (1990) and Sommersby (1993), the fine serial killer thriller Copycat (1995) and the Charles Darwin biopic Creation (2009). Alas, after increasingly brain-numbing films like his previous offering, the millennial caper film Entrapment (1999), and The Core, Jon Amiel’s good name is increasingly coming to seem more like the coincidence of good scripting than any ability on his part.